Some time ago, during one of my contests, I asked people what things they wanted to see me focus on at My Dreams of Disney. One of the comments from that question was that they wanted to see more information on places that toddlers and preschoolers could enjoy, other then rides. Fortunately, there are several things that you can enjoy at Walt Disney World that are off the beaten path, so to speak, so I’m going to look into some of these hidden treasures that you can find at each of the parks! OK, so this might have been a stretch, particularly when you factor in that there are hundreds of steps (116 to be exact, although I’ve never counted them!) — so for a toddler or preschooler, this might be a fools wish. But what I do know is that my daughter and I LOVE to climb the treehouse, and if you can do it, some of the best views of the Magic Kingdom can be had from the top. So don’t discount this attraction too quickly, you might be in for a hidden gem if you give it a try! Tom Sawyer Island is accessible by boat, but when you go to the island, it’s a hidden paradise right in the middle of the Rivers of America. Filled with all sorts of things for the kids to enjoy, there is almost no end to the fun that your little ones will have there! Explore the caves, play at the fort, jump on the barrel bridge, and more! Most of all, it will give us parents a chance to just relax for a while also! For a little fun, check out the train layout located at the Germany Pavilion. This garden-scale layout is equipped with several trains, a small village, and best of all, the Cast Members deck out the village with various scenes depending on the time of year that you visit! Last October, when we were there, they had several of the kiosks setup for the Food and Wine Festival. I love trains, so I always find time to enjoy them a bit when we are visiting. Located in the back of the United Kingdom Pavilion, you will find a garden maze setup. This fun little maze is a perfect way to let your kids roam for a bit while you are able to just relax at the entrance. It is secluded, there is hardly any traffic to it, and it’s a fun little adventure that they will love! In this children’s area, kids are free to roam around and climb, slide, get wet, and frolic while you take a break and relax! This dinosaur dig site was one of my daughter’s favorites, and we have made many trips there over the years. Basically, you are looking for the fossils that the boneyard has to offer up. Can you find them? The Affection Section is located at Rafiki’s Planet Watch, and is a good ol’ fashioned petting zoo. This is one location that you will like from the perspective of getting some additional information on the different animals at Animal Kingdom! Does your child have some favorite things that they like to do that don’t involve attractions? If so, please share them in the comments! 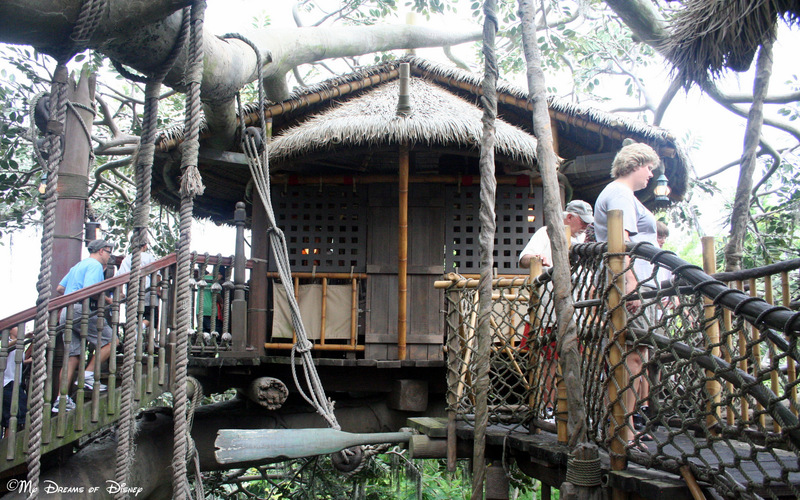 72 Days til Disneyland – Chip ‘n Dale Treehouse! Previous Post: Disney in Pictures – Favorite Disney Attraction!